8 is my lucky number – and has been since I was 8! 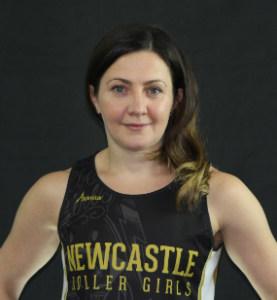 There are too many mention as a skater – Newcastle’s first ever bout, our first ever win, our first ever international game, captaining the Belters being a few. As a line-up, it’s being part of the team at Beach Brawl – our first ever USA tournament, which was a fantastic experience. How did you first discover roller derby? I just wanted to roller skate and I was lucky enough that I heard on the grapevine that a roller derby team was starting in Newcastle. I had no idea it was full contact or that I’d still be involved 7 years later. What’s your advice for anyone interested in starting? Go along and take a positive attitude with you. What other training do you do when you’re not on eight wheels? Mostly weight training and open water swimming at the moment.